Higher mills stood where Dyer’s Close is today at the end of Church Street off Ingersley Vale, opposite the Crown Inn. The original four story mill was built in 1789/90 by George Antrobus and passed on his death in 1820 to his son Philip Antrobus, who had at that date just completed building Lowerhouse mill. The second, three story, mill on the site was built at right angles to the first in 1830. By 1832 Philip Antrobus had died and the mill was leased to Messrs Swindells and Oliver, each of whom also had other mills in Bollington. On the 1871 map these mills are shown as Upper mill. 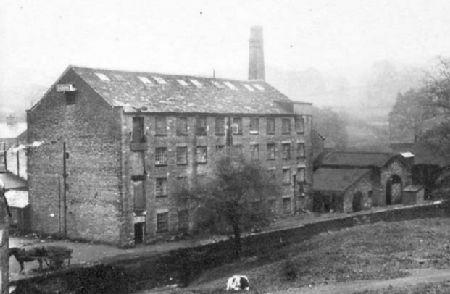 The Swindells (Martin II and/or George) sold Higher mill in 1859, just three years after they had completed the building of Adelphi mill. From about 1874, the three story mill became home to a large brewery operated by Parrott & Horsfield (see Brewers and Bottlers). 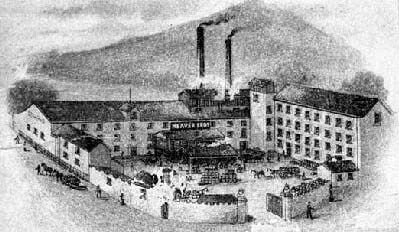 In 1893, on the bankruptcy of Thomas Horsfield, the brewery was taken over by Heaver Bros. In 1920 they converted the mill to a bottling plant, but in 1931 this part of the mill burnt down and, while the mill was rebuilt, the business was never resurrected. The four story building was used for a variety of purposes over the years including Neaves hat factory, and, later, Radions radio valve repairs. By 1936 the entire site was taken over by Shrigley Dyers, for bleaching and dyeing, and they continued there until the late 1990s, when they moved to Leek and the site was sold to Linden Homes who redeveloped it with domestic housing and named it Dyer’s Close. In 1925 there was a serious spillage of Mercury in the mill and this heavy liquid metal, used by Radions, found its way into the cracks in the timber and stone floors and was the source of great amusement. Today we know how poisonous Mercury is and would treat it as a dangerous contaminant. This is the only mill in Bollington to which is attached a story of a ghost! It is thought that someone got walled up in a small space and later appeared to walk through the wall and up and down the stairs! The mill pond was in Ingersley Vale immediately adjacent to the mills. When the housing was developed, about half the pond was stanked off and the space included in the housing scheme. See the page on mill ponds. The pond is thought to have been sold in 2016 though for what purpose is not clear.